Members of Bishop Shanahan High School's Community Service Corps donated money and then purchased, wrapped and delivered gifts to St. Agnes Parish on Dec. 12. The Community Service Corps (CSC) at Bishop Shanahan High School, a service club under the direction of moderator Rebecca Pine, participated in the Holy Family/Christmas Child Program run by the St. Agnes Parish Outreach in West Chester. 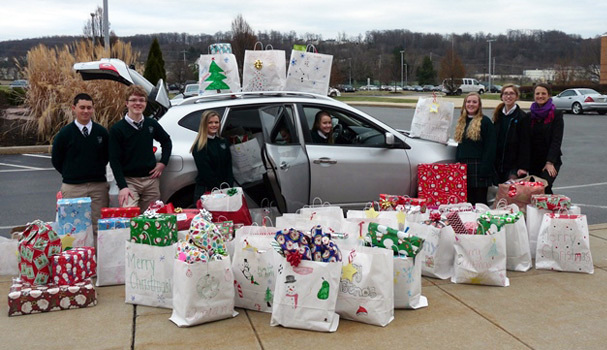 Bishop Shanahan students donated money and then purchased, wrapped and delivered gifts to the parish on Dec. 12. Each of the 36 homerooms was assigned a child and additional children were provided for by extracurricular clubs, faculty and staff. Fifteen Shanahan freshmen were installed as Student Council homeroom representatives and representatives-at-large at an installation ceremony held Friday, Dec. 12. Newly installed members are Dominic Forgione, Daniel DiBenedetto, Gianna Vitelli, Joseph Fullam, Bryn Casagrande, Andrew Smyth, Ava Braccia, Tristan Lynch, Alyssa Lindley, Vishal Ramola, Tess Elder, Shimon Hilton, Rebecca Nguyen, Patrick Russell, and David Angelo. Twelve members of the Shanahan football team were named all-stars in the ChesMont League. They are (l to r) Nick Pasvanis, Jeff Zebrowski, Dan Murphy, Matt Evans, Pat Corcoran, Doug Costin, Cody Smith, Jerry Riccardo, Greg Rankin, Michael Sprague, Jake Geiger, and Kevin Stein. 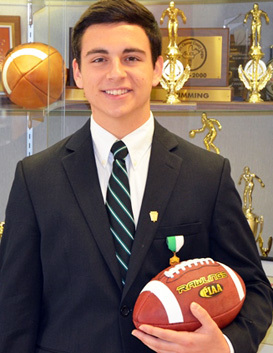 In addition, senior Daniel Lindstrom has been recognized by the Ches-Mont League as an Academic All-Star for his high grade-point average and his participation on the Shanahan football team. Bishop Shanahan sophomores Julia Ulsh and Michael DeBoer. 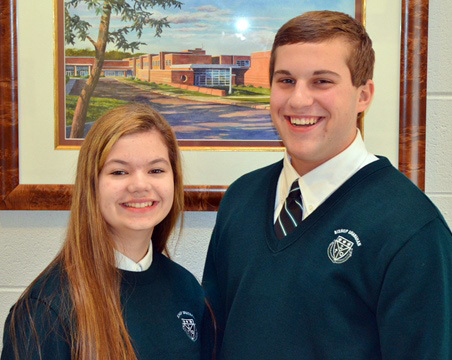 Bishop Shanahan sophomores Julia Ulsh and Michael DeBoer have been selected to attend the 2015 Hugh O’Brien Youth Leadership (HOBY) Seminar May 29-31 at Villanova University. The event is acknowledged worldwide for its excellence in leadership training. Selection for the HOBY award is based on perceived leadership ability, outstanding communication skills, critical and creative thinking, strong decision-making skills and sensitivity to the needs of others. Students are nominated by their freshman teachers. Cheryl Mrazik, the Northeast/Mid-Atlantic Representative of Catholic Relief Services, presented a plaque recently to Immaculate Heart Sisters Maureen McDermott and Regina Plunkett, principal and president of Shanahan respectively, in commemoration of the school’s accomplishment. Bishop Shanahan has made it part of its mission to foster students who are critical thinkers and moral stewards in a rapidly evolving global environment. During the 2013-14 school year, Bishop Shanahan devoted an entire month of activities to raising students’ awareness of the plight of children across the world regarding hunger, disease and other social issues. This year, the activities will revolve around peace building initiatives across global communities. Brother-and-sister sophomores Nolan and Grace Wible. Bishop Shanahan sophomore Grace Wible and her brother, Nolan, a senior, have been selected as members of the Pennsylvania Music Educators Association’s District XII Orchestra. 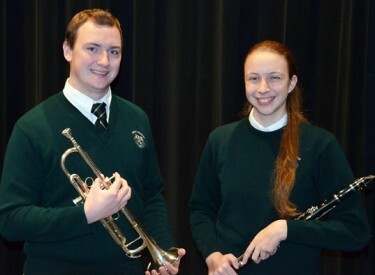 Nolan Wible and sophomore Eileen Mostyn have been selected as members of the District XII Band. Four Shanahan students have been selected as members of the District XII Chorus, including Megan McCarthy, Michael DeBoer, Julia Harrer, and Victoria Sellers. 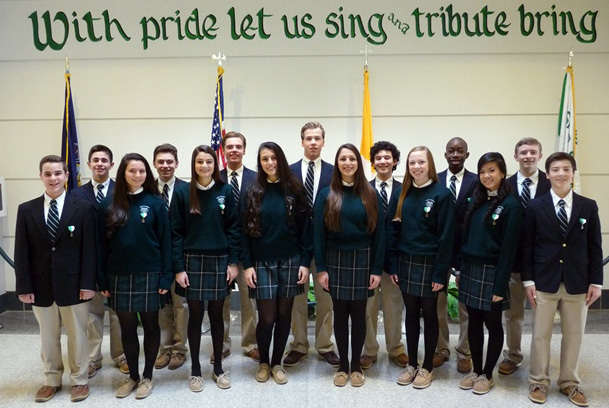 Fifteen Shanahan freshmen installed as Student Council homeroom representatives and representatives-at-large Dec. 12 include, from left, Dominic Forgione, Daniel DiBenedetto, Gianna Vitelli, Joseph Fullam, Bryn Casagrande, Andrew Smyth, Ava Braccia, Tristan Lynch, Alyssa Lindley, Vishal Ramola, Tess Elder, Shimon Hilton, Rebecca Nguyen, Patrick Russell and David Angelo.